We went to our friends AJ and Jeremy's book release party this weekend. 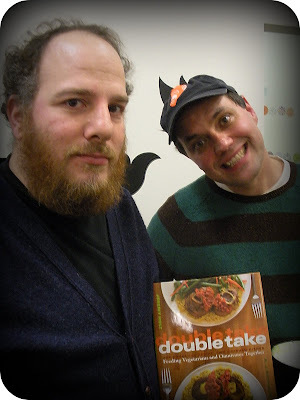 They just put out a new cookbook called Double Take. The coolest thing about this cookbook is that it is full of recipes for Vegetarians and Omnivores. I can't wait to use this book for our next shin-dig. I bet you all can't wait to be invited. oh how awesome, especially for vegetarian/meat eating couples such as I have been a part of! haha. I will have to get a copy of that cookbook! Dan and I are a vegetarian/meat eating couple. Sometimes I get really grossed out. Oh, and I ate the veggie versions of the recipe's at the party and they were SO GOOD. Dan said the meat one's were good too.